The Mueller report won't stay secret forever. How William Barr redacts it will determine his place in history. Watergate showed that a president's redactions rarely last forever, and can come back to bite him. One way or the other — sooner or later — the full Mueller report will be revealed to the American public redaction-free. That will be the moment that will decide how Attorney General William Barr is regarded by history, based on how broadly he will have chosen to conceal from Congress aspects of Special Counsel Robert Mueller’s almost 400-page report. Watergate teaches that, if Barr succumbs to political pressure or a personal preference to generously employ redactions to hide damaging evidence marshaled in Mueller’s report and delivers a questionably-excised report to Congress, the ploy can boomerang both politically and legally. 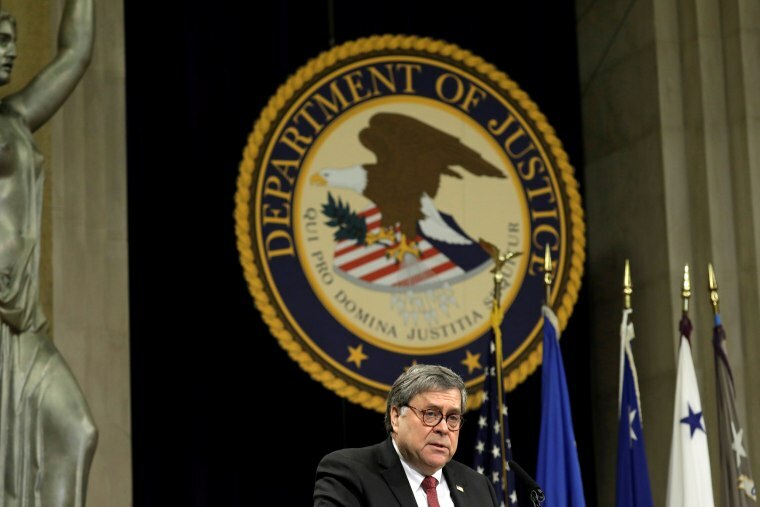 Sanitizing Mueller’s findings might seemingly protect President Trump and bolster Barr’s conclusion that Trump had not been guilty of criminal obstruction of justice. But in reality, Barr may stumble into a trap with dire consequences for both him and the White House. Redactions based upon Barr’s categories 1 and 4 are the most subjective: The “grand jury” label might conceivably be stretched to hide lengthy sections of Mueller’s report; or the “privacy” hook could be activated to bury conduct revealing Trump, his campaign, his family and his staff in an unflattering and unethical — if not illegal — light. History suggests either or both could fail. Whether Trump obstructed justice isn't the attorney general's call to make. It's Congress' decision. The full D.C. Circuit Court of Appeals, in what is known as an en banc ruling, upheld Sirica’s decision at the time. And while a panel of that court ruled 2-1 last Friday that a federal judge lacked authority to grant an historian’s request for grand jury information, the decision noted that a request to provide information to Congress was a different matter. While the House today has not launched an impeachment inquiry yet, the Judiciary Committee is the authorized body for any such inquiry and a federal judge might well rule that its preliminary oversight role at this stage equally justifies release of grand jury materials. And, any redactions based upon privacy interests of “peripheral third parties” will be an even shakier proposition to uphold, if those individuals happen to be been high-ranking Trump campaign officials or senior White House aides. Congress is entitled to examine whether the conduct was improper or unethical, even if not sufficient to convict of a federal crime. President Nixon’s administration tried, and failed, to protect themselves with a similar strategy of releasing redacted materials to the House Judiciary Committee in 1974. The committee and the special prosecutor had subpoenaed President Nixon to produce White House tape recordings. Initially Nixon refused to produce tapes to Congress. But on March 1, 1974, the Watergate grand jury — as part of its indictments against both the burglars and White House aides for the cover-up — sought permission from Judge John Sirica, to deliver a report and 12 tapes to the Judiciary Committee; as mentioned, he eventually gave it. In April, after receiving a subpoena for 42 tapes from the committee and facing subpoenas for 64 tapes from the special prosecutor in the criminal case, the White House released 1,200 pages of edited transcripts of 33 recorded conversations, claiming that the redacted portions contained no information about “the question about what I knew about Watergate or the coverup and what I did about it,” as Nixon claimed in a televised address. In May, the committee began impeachment hearings; the Supreme Court eventually ordered the White House to release additional tapes sought by the committee and the special prosecutor in July. But with key tapes already in hand, the committee’s impeachment inquiry staff tested the accuracy and completeness of the edited transcripts. In its final report, the committee found that significant parts of Nixon’s discussions about Watergate with key aides were missing. The discrepancy between Nixon’s so-called “expletive deleted” transcripts and the words on the actual tape recordings led the committee, in its final report, to find that the transcripts were “untrustworthy.” In other words, the redactions, once proved relevant to the inquiry, provided another opening against the president rather than protection for him. And the wheels are already in motion for Barr’s redaction decisions to be independently evaluated. After Barr missed the House Judiciary Committee’s April 2 deadline to deliver the complete Mueller report, the committee voted to authorize a subpoena demanding that Barr turn over the Mueller report without redactions, as well as Mueller’s underlying evidence. While Committee Chairman Rep. Jerrold Nadler, D-N.Y., has publicly stated that Barr would be given time to change his mind before the subpoena is served, the odds of Barr releasing the full Mueller report without redactions are very low. Assuming that Barr nonetheless redacts portions of Mueller’s report, Congress likely will ask a federal court to make Barr comply. And if a judge orders previously-redacted parts of the Mueller report to be given to Congress — or even made public — the comparison of Barr’s redacted version and the more complete Mueller report will be scrutinized. Like the Judiciary Committee’s reaction to the fiasco of Nixon’s edited White House transcripts, if Barr has hidden key aspects of the Mueller report with an overreaching redaction strategy, the criticism will be severe for both Trump and Barr. It’s not too late for Barr to change his mind. As the experienced lawyer that he is, Barr should foresee and can dodge the patina of a cover-up, by providing the full, unredacted Mueller report to Congress. The choice is his, and his own legacy is in his hands. Michael Conway served as counsel for the U.S. House Judiciary Committee in the impeachment inquiry of President Richard M. Nixon in 1974. In that role, he assisted in drafting the committee’s final report to the House of Representatives in support of the three Articles of Impeachment adopted by the committee. Conway is a graduate of Yale Law School, a fellow of the American College of Trial Lawyers and a retired partner of Foley & Lardner LLP in Chicago.